Alright, either I'm just that ignorant that I can't figure it out or I'm just missing something, but can someone please instruct me on how to post events to the Team Easyboot calendar in Google. I have exhausted myself trying to figure it out. All help is greatly appreciated. I just relocated from California to Millbrook, New York. Seems to be right down the street from Amy Sheehy, maybe we can get in contact and talk about horses! I'm currently looking for some clients to do some natural hoof trimming for in this area. I may be moving to Mass. this year, but not sure yet. The snow is slowly going here in Manitoba, Canada. 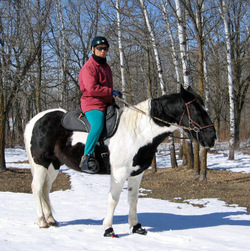 I have attached a pic of my TWH horse Spirit & I from last weeks first ride of the season. Spirit is the horse I wrote about in my article on the Blog about founder. He is recovering nicely.. in part thanks to BARES. I am hoping to have some Edge boots for next winter to get a better "grip" on winter riding. 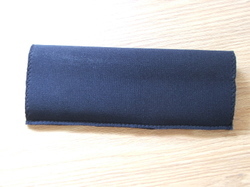 Hi everyone - we are going to start sending items out to each of you. We had some things delayed so what we are going to do is send what we have now and then get the rest to you later. I hate to keep things held up for very much longer. We'll do this in batches so that it is manageable and doesn't overwhelm our staff ;). If you have an event coming up soon and I haven't already confirmed that we are sending things your way, just let myself or Tara know. For you Team Easyboot members that are endurance riders - we'll be sending you forms for the hoof boot contest. Please do your best when you are at a ride to sign up riders who are riding in EasyCare boots. They can receive 50% credit for using two boots, and for any distance. Also - if you'd like to get some spare parts to have on hand to help riders (or for your own use) that need them we can do that if you are willing to help with the part replacement. Still working out more tweaks in the Edge's and some various gaiter versions. We are also making an online submission form for feedback so that we can keep up with all of your feedback once we get you some product out to test! Hello everyone! My name is Teri Payne and I live in sunny southern California, specifically the Mojave Desert. It's really rocky here and my horses are barefoot so Easy Boots have been a real help. I have two Morgan geldings. Knight will be 4 this year and I'm looking forward to training him. Red came to me as a weanling and is now ten years old. 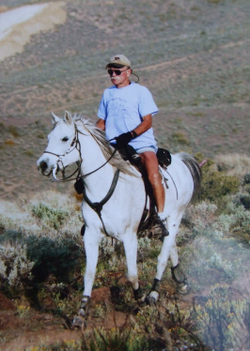 He was my first youngster to raise and he¹s been my partner in exploring all sorts of new horse activities. Together we've participated in clinics, play days, a little cattle sorting (he¹s a hoot with cattle! ), trail trials, gymkhana, and plenty of good old trail riding with friends. The past couple of summers we¹ve been camping, which always has been one of my favorite activities even before horses. 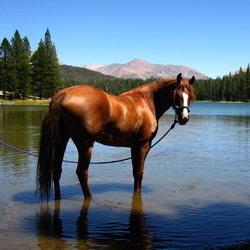 Last summer, my sister and I took Red and my husband¹s Quarter Horse, Dolly, camping in the high country of Yosemite National Park in California. We live in the desert so trees, meadows, and water were a bit of sensory overload at first, as were the deer that seemed to be everywhere and came bounding through camp occasionally. Our horses quickly adjusted to this as well as the hikers with their big backpacks. Highlining was a first for everyone, but Red and Dolly did fine, except one morning at dawn when Red woke us with his whinnies and we found Dolly gone! Sharon called for her and she came running from where she had been eating out of the back of my truck. Whew! We still don¹t know how she got the clip unhooked under her chin and wonder if someone let her loose. But all's well that ends well! Being that we don¹t encounter many water crossings in the desert, Red always behaves as if he¹s never seen it before. Oddly he just wandered into the stream to drink and at first he didn¹t want to come out. I think it was because the water was so clean and clear that he could see the bottom and was not worried about walking into a bottomless hole. Red had lots of "good" water experiences in Yosemite. The Tuolumne Meadows area has a variety of trails all with gorgeous scenery. The Pacific Crest and John Muir Trails run through these meadows. Although our horses were barefoot and we stayed on easy trails, there were enough to keep us busy for three days of riding. Next time, we won't forget our Easy Boots and will have more trail options. 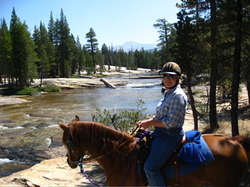 My favorite ride was from Tuolumne Meadows to Dog Lake. About a half mile of it was a bit of an uphill for our flatlander horses, but not too difficult and definitely worth it. Once there we had lunch on the banks of this little jewel of a lake, then I took pictures while Sharon played in the lake with the horses and showed them off to little girls who petted their soft noses. Late in the afternoon of our last day, we rode silently through the forest, memorizing sights, scents, and sounds. Deer grazed on bright green grass on the forest floor lit with shafts of afternoon sun breaking through the trees. Heaven has to look just like this! The does had small spotted fawns with them and we even saw two sets of twins. They didn¹t seem to care about us as long as we were quiet, and when one pair wandered off we¹d just mosey down the trail until we came across another pair. It was the perfect ending to a perfect trip. Well what a weekend. Alot of laughs were had and tears were shead - but that is HORSES AND ENDURANCE for you!! Overall I was more than impressed with my boy - he was fast, fit and tried his heart out. He came in 2nd middleweight with a time of 6hrs 3mins and got to compete for Best Conditioned. Unfortunately about an hour after best conditioned workouts he wasnt quite right and had a mild colic. Heart rate was normal, temp, capilary, jugular, and gut sounds all normal at that time but he just wasnt comfortable. I had the vet look at him and due to the fact that he was administered pain relief within 2 hours of vetting in I lost my place - if another 18 minutes had past before he was given the shot he still would come 2nd LOL. A little frustrating but as long as he got better I was happy. That night he was stuffing his face with anything he could find and drinking normally again so was very relieved. Arrived home today (sunday) and he is fully hydrated now and cantering around the paddock. He has dropped absolutely no weight at all and even though we had a late disqualification due to his treatment I am still proud of his vet scores as he received all A's and 1'S except for one B at the end so he had all his vet checks with near perfect scores - so proud of him! We will see how he goes the next ride - there are a few things I will change for the more humid days and hopefully he will be great at Woodstock at the end of March! He was ridden in 4 Bares. A friend rode in epics - had one latch smash to pieces, one gaiter totally came off the boot and the boot flung off and is lost and another boot the gaiter broke as well - these were both brand new boots. I have a suspicion the boot that came off was to big but I dont think the gaiter should have seperated from the boot??? I havent looked at the boot yet to see exactley what happened. BUT she is still a boot convert and I think just needs better fitting! Good luck with the start of everyone elses seasons!